Research in Motion CEO Thorsten Heins has talked to German newspaper Die Welt about the options the company has if their newest operating system and line of devices for BlackBerry 10 doesn’t succeed. Heins still has an optimistic approach, believing that the new line of devices with touchscreens for BlackBerry 10 will win back support for the company. In recent years, RIM has lost a lot of ground to Apple’s iPhone and Android powered competitors. One of the biggest options that Heins may have to look at with his company is selling the hardware side of the business, which will save a lot of money. RIM will then turn to selling licensing to other manufacturers. Again, this is one of RIM’s final options, if BlackBerry 10 is truly unsuccessful and the company doesn’t see a boost in usage. With the excitement of launch, we suspect many want a BlackBerry 10 phone. RIM has shown some great movements in the lead up to BlackBerry 10, with over 80,000 apps now on BlackBerry World app store and RIM modernising the operating system to compete against Android. We don’t expect RIM to lose out in this race, with the new BlackBerry line, we could see a complete rejuvenation of the company. They still hold a competitive third place, with iOS in second and Android at the top. 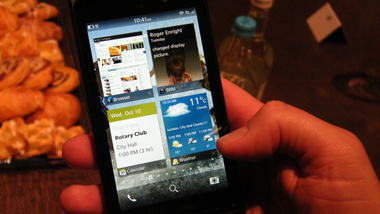 BlackBerry 10 will launch on January 30, with a large selection of devices, high-tier to budget, available for purchase. RIM are looking to make their devices as available and affordable as possible, to any audience.